MAHA Forest (Maharashtra Revenue and Forest Department),Nagpur Published Job Notification for 02 Veterinary Officer & Veterinary Supervisor Posts. Candidates who wish to apply must look at MAHA Forest Veterinary Officer & Veterinary Supervisor Recruitment 2018. Eligible candidates can apply Offline before 15-03-2018. Education Qualification: Veterin Graduation in Veterinary Science (BVSc), must be a registered veterinary practioner with valid registration of VCI or MSVC/ Diploma in Veterinary Science and More. For Post wise Education Details follow the detailed advertisement. Interested & Eligible candidates can send their application along with all the necessary documents and testimonials to OFFICE OF THE CHIEF CONSERVATOR OF FORESTS (TERRITORIAL), NAGPUR, BSNL SANCHAR LAXMI BUILDING, KASTURCHAND PARK, NAGPUR-01. Starting Date, Last Date to Apply Offline at Maharashtra Revenue and Forest Department which candidates should be remembers as follows. Last Date to Apply Offline: 15-03-2018. MAHA Forest (Maharashtra Revenue and Forest Department), Mumbai Published Job Notification for 07 Assistant Director – Deputy Director Posts. Candidates who wish to apply must look at MAHA Forest Assistant Director – Deputy Director Recruitment 2018. Eligible candidates can apply online before 24-01-2018. 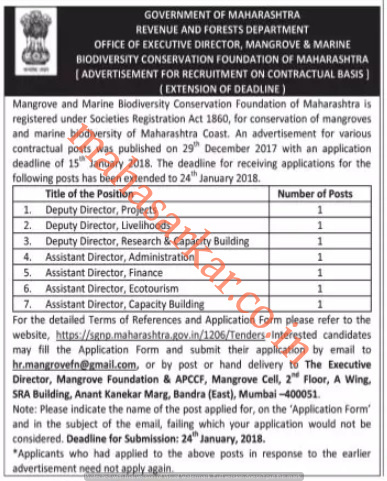 Candidate have to submit application through E-mail hr.mangrovefn@gmail.com or by post or hand delivery to The Executive Director, Mangrove Foundation & APCCF, Mangrove Cell, 2nd Floor, A Wing, SRA Building, Anant Kanekar Marg, Bandra (East), Mumbai 51. Starting Date, Last Date to Apply online at Maharashtra Revenue and Forest Department which candidates should be remember as follows. Start Date to Apply online: 18-01-2018. Last Date to Apply online: 24-01-2018. MAHA Forest (Maharashtra Forest Department), Maharashtra Published Job Notification for 03 Forest Officer – Assistant Forest Guard Posts. Candidates who wish to apply must look at MAHA Forest Recruitment 2017. Eligible candidates can apply offline before 27th November 2017. Interested & Eligible candidates can send their application along with all the necessary documents and testimonials to Office of Chief Conservator of Yavatmal, Yavatmal-445001. Starting Date, Last Date to Apply offline at Maharashtra Forest Department which candidates should be remember as follows. Last Date to Apply offline: 27-11-2017. Maha Forest (Maharashtra Forest Department), Maharashtra Published Job Notification for 15 Sales Officer – District Information Officer & More Posts. Candidates who wish to apply must look at Maha Forest Recruitment 2017. Eligible candidates can apply offline before 25th September 2017. Education Qualification: 10th /12th/Graduation/Post Graduation/Master Degree and More. For Post wise Education Details follow the detailed advertisement. Forest Department, Wan Bhavan, Ramgiri Road, Civil Lines, Nagpur, Maharashtra 440001. Forest Department, Vanvardhan Building, Tarabai Park, Kolhapur – 416003. Start Date to Apply Offline: 15-09-2017. Last Date to Apply Offline: 25-09-2017. Maha Forest (Maharashtra Forest Department), Dhule Published Job Notification for 06 Forest Guard & Forestry-Man Posts. Candidates who wish to apply must look at Maha Forest Recruitment 2017. Eligible candidates can apply offline before 25th September 2017. Education Qualification: 8th/ SSC/ HSC Pass and More. For Post wise Education Details follow the detailed advertisement. Interested & Eligible candidates can send their application along with all the necessary documents and testimonials to Forest department, Dr. Rammanohar Lohiya Marg, Lenin Chowk, Dhule 424001. I searched on the official website for the vacancies of Forest officer for NAGPUR but i do not found any notification or any kind of details. Please help, what to do?